Origin Records - nominated for Label of the Year - 2009, along with Concord, Palmetto, Sunnyside and Heads Up Records at the annual Jazz Week Summit in Rochester, NY. Original compositions, influenced by the history and tradition of jazz: swing, hard bop, cool, fusion, latin and beautiful ballads. The soulful, introspective, and interesting compositions by Fred, serve as a vehicle for the three distinctive voices of Forney, Marohnic and Winston. Each song accompanies a story found in the liner notes, edited by Paul Morris. Brice Winston - tenor, Chuck Marohnic - piano, Dwight Kilian - bass, Dom Moio - drums. Forney penned seven originals for this session and it is apparent that he is a seasoned player; not only are there no weak songs, but he knows how to pace a program, something young players often overlook when they surround themselves with fellow newbies and inexperienced producers. Nor does Forney hog the spotlight; he has the confidence to let others take the opening solos. It's hard to pick highlights, though his tense "The Mystic" with its eerie muted trumpet and tenor sax in unison, the breezy "Astoria," and his energetic opening "Nearly Human" (dedicated to his very active Labrador, Miles) all leave lasting impressions. 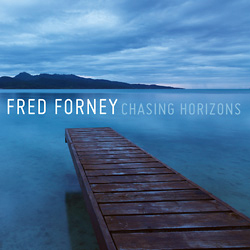 With major labels focusing excessively on young unproven talent all too often, jazz fans will be better served by investigating small-label offerings such as Fred Forney's superb Chasing Horizons.